Last week began and ended with hours of kiddie concerts. My tiny ballet dancer skipped around the stage first as a Ginger Snap and then as a Chinese Tea leaf in the ballet school’s production of “The Nutcracker.” It’s a beautiful show, with music and costumes and dances that carry the audience on a snowflake cloud of sugar plum dreams. For 120 minutes. My Ginger Snap was up there for maybe three of those minutes. And another three for the Tea the following day. I drifted. Shifted in my uncomfortable seat. Told my sons to “ssshh” when they asked if it was over. When would it be over? I wondered the same. It was beautiful and graceful and fun to watch, but of course we were there to see her, and we were wriggly and fidgety and wished we were elsewhere. And then we glimpsed her smiling face under the floppy gingerbread hat, and she saw us waving wildly from the audience. And she beamed. Missed a step. And beamed some more. The end of the week found me back in an audience, again for hours. 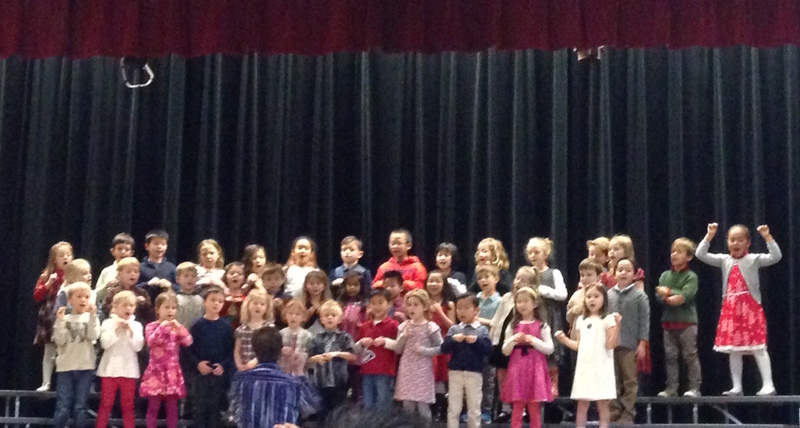 This time at the school’s annual winter concert. I jostled for a seat as near to the front as I could find, amongst bright, puffy jackets and dripping umbrellas, and parents who had the foresight to reserve the best seats much earlier than I did. Squeezed somewhere in the middle of the middle, I waved like a wild woman when my Kindergartner took his place on the stage. He whispered in his friend’s ear, pulled funny faces and did not stand still for a minute. Despite my frantic hands in the air, he had no idea I was there. What’s the point? I wondered crossly. Resentfully, I settled into my immovable chair for the next three hours. All the kids sang sweetly. Pounded on xylophones. Played the violin and the trumpet and even the cello with their small 10-year-old fingers. But the morning dragged in a stuffy cacophony of restless coughs and whispers. We had all carved time away from work and errands, meetings and appointments to watch the children showcase their musical talents, but of course we were there to watch our own children. Many parents left as soon as their child had performed. They had places to be, so many things to do on that busy, wet Friday morning, the last before the holidays and no-school-till-2015. I watched them creep out, one after the other, with something like envy and disappointment. That they didn’t stay to watch my child. That I couldn’t leave. I couldn’t leave because my son is in fifth grade, and the fifth graders performed the newly-composed school song, at the very, very, very end. I was tired, hungry and irritable. I moved seats. I chatted incessantly to the friend sitting next to me. Her son is also in fifth grade. I thought about everything else that needed my attention. I wished I were elsewhere, doing those things. It had been almost three hours since my little one sang the snowflake song, seemingly oblivious to my presence in the audience. Now I watched my big boy take his place in the left corner of the stage. Somehow I had unknowingly found a seat on the same side as he was. Finally, I thought, as I distractedly gazed at the sea of faces on the stage. Just a few more minutes, and I can get on with my day. A tiny movement on the left caught my eye. I focused my attention, turned my head so slightly. My son looked straight at me. And smiled. That small, almost self-conscious smile that means he’s happy. He ducked his head for a second, and looked back up at me. I heard his thought: My mom is here. For me. The music teacher raised his arms. The opening chords filled the almost-empty theater. “We work hard, take care, so we all can learn and play. Beaming Ginger Snaps and fidgety five-year-olds and school pride in the fifth grade. I have years of performances and ceremonies, Nutcrackers and school concerts ahead of me. At times I will be restless in the uncomfortable chair. I will resent that I didn’t get there early enough and all the good seats are taken. I will wish I were somewhere else. And then my kids will stand in front of the audience. They will scan the crowd, and catch my eye and smile a tiny smile. And they will know that I am there. For them. And for me. This is a Finish the Sentence Friday post, inspired by the prompt, “When I’m really old, I hope to look back at my life and know that I…” Hosted by Kristi from Finding Ninee, and guest hosts Vidya from Vidya Sury and Kerri from Undiagnosed but Okay. This entry was posted in Discovering Mommy and tagged ballet, concert, FTSF, Nutcracker, performance, school song by Nicki. Bookmark the permalink. Thanks Kristi! I was a little choked up during that school song. Actually I thought about it a lot after reading your post and realised that I really loved & enjoyed watching all your, Tania and Doron’s performances, from drama to ballet to modern and to school plays.. especially if all the ‘other’ kids performed well! I didn’t find it tiresome. But I enjoyed them even more (when other kids were performing), if I was helping with makeup, hair.. you know me. It broke the monotony of long hours. It was the shlepping to rehearsals and lessons that nearly killed me. The car was my enemy in those days. Oh so lovely. Brings back so many memories for me as well. i am sad now that these endless concert days are over. However we have memories and we were just sharing some of them yesterday. About the early days when I didn’t know how important it was to get there EARLY, so I was relegated to the very back of the gym, the time my friend’s daughter was playing Mrs. Clause and dropped the knitting yarn and it rolled along the ground and off the stage, and yes, that time a little kindergartner threw up into the stage curtain and we were treated to vomit fumes the rest of the night … My two remember it all. Thanks for reminding me once again how important it is to stay. The vomit, oh no! Love the knitting yarn story. It’s great to hear your kids remember all of it, Kelly. And I’m happy I reminded myself how important it is to stay. I will have to re-read this a few times in the comng years ;). I teared up a bit, Nicki – the moment your son caught your eye and smiled. I’m doing it again as I type this. Our days of school performances are over, but the days of two basketball games a week are in full swing. He says he doesn’t care if I come, but he does. And so do I. That made me tear up. Very sweet, and so understandable. Awww I always feel the same way when I am forced to endure one of Abby’s concerts. But then the moment she spies me in the audience, the smile that lights up her face. It is worth every moment in that God awful chair. Fantastic post, Nicky 🙂 I’ll definitely share it! Just this weekend, we went somewhere to support my husband, taking along my son. He kept complaining that he was bored. I asked him if he liked us to be there for his things and events, and he responded yes. It made me feel good to know that he knew I was there and how good it felt when I was. I love how you brought it back to him April and showed him in real life what we feel as parents! Thanks for sharing this here.